Used by thousands of researchers at hundreds of top research institutions and museums around the globe, Checkpoint is an integrated software package for geometric morphometrics that enables you to easily collect, manipulate and analyze thousands of landmark and semi-landmark points in 3D. In seconds, it loads both surface meshes and volumetric scans for use in shape analysis, shape modeling and diagnostic imaging. Checkpoint’s user-friendly 3D landmark editing interface empowers you to quickly place single points, curves and patches to represent even the most complex specimen morphology. This state-of-the-art tool gives you the ability to inspect, perform statistical analysis and virtually manipulate, and measure every anatomic feature on laser-scanned surfaces or within micro-CT, CBCT, CT or MRI scans. 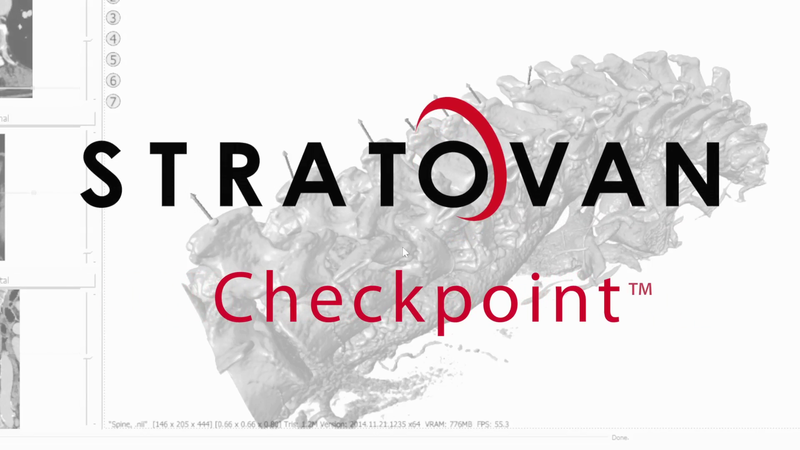 Find out for yourself why Checkpoint is the world’s leader in 3D shape analysis and morphometrics. Citing Checkpoint in Academic Publications? Click Citations below. Place landmark points, curves, and patches. Automatic generation of semi-landmark points along curves and patches. Export landmarks to common file formats. Load DICOM scans (DCM files). 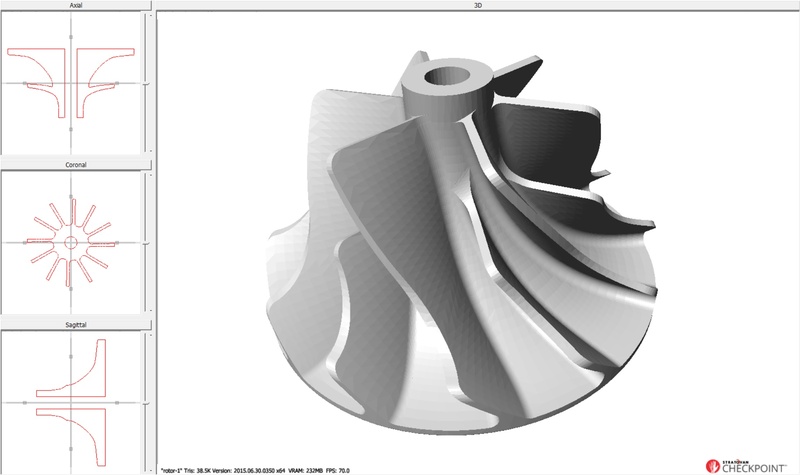 Load PLY, STL, OBJ, and WRL surfaces. Extract multiple isosurfaces from volume (DICOM) scans (and export them). Axial, coronal, and sagittal slicing. Convert volume data (DICOM .DCM, NifTI .NII, Analyze .HDR, .VTK) to NII format. Convert surfaces from one format (STL, PLY, OBJ) to another. 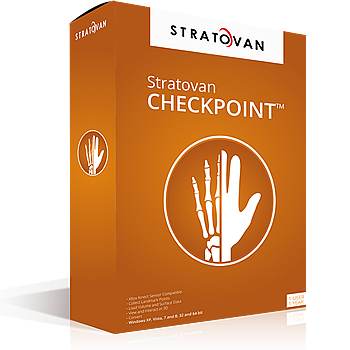 Download Stratovan Checkpoint 32bit or Stratovan Checkpoint 64bit today! Note: if you need a particular file format, please let us know and we'll do our best to add it. Single point Place a single point landmark point at biologically relevant locations. Curve Place two or more points and automatically generate several semi-landmark points along the curve. Patch Place a grid of points to cover large regions. The edge points and middle point can be moved to give flexibility to the patch shape. Joint Place two opposing homologous patches of points on two opposing joint surfaces to collect a matching set of points that can be used to analyze joint congruence. Length Pick two points and compute the length between them. Angle Pick three or four points (two lines) and compute the angle between them. Plane Pick three or four points to compute a reference plane through them. 3D Reconstruction Perform a multi-planar reconstruction of 3D medical data from CT and MRI scans. Volume rendering Various interactive volume visualization are provided to explore your volumetric data. Surface extraction Extract multiple iso surface from your volumetric data, export the surfaces, and/or place landmark primitives (points, curves, patches, etc.) on them. Surface rendering Interactive surface rendering or loaded surfaces or extracted surface from DICOM data. Interactive Intuitive, easy to use interfaces, that allow you to interact with your data. Load DICOM, NifTI, TIFF Image Stacks and more. Extract 3D surfaces and export them as STL, PLY, and OBJ files. Large Surfaces Works with large surfaces containing millions of triangles (> 2M). Geometric Morphometrics Easily collect thousands of landmark points on dozens of specimens. Checkpoint's easy to use landmark editing tools allows you to gather numerous 3D points faster and more accurately than other tools. Generalized Procrustes Analysis Perform sophisticated 3D statistical analysis based collected points including statistical shape, morphometric, and procrustes analysis. Statistical Shape Analysis Export collected points from Checkpoint for use in other popular analysis tools. Easily view, interact, and understand your specimen. State of the art visualization tools allow you to inspect, manipulate, and measure every anatomic feature. Checkpoint is designed and built by the same team that developed the popular IDAV Landmark Editor software. 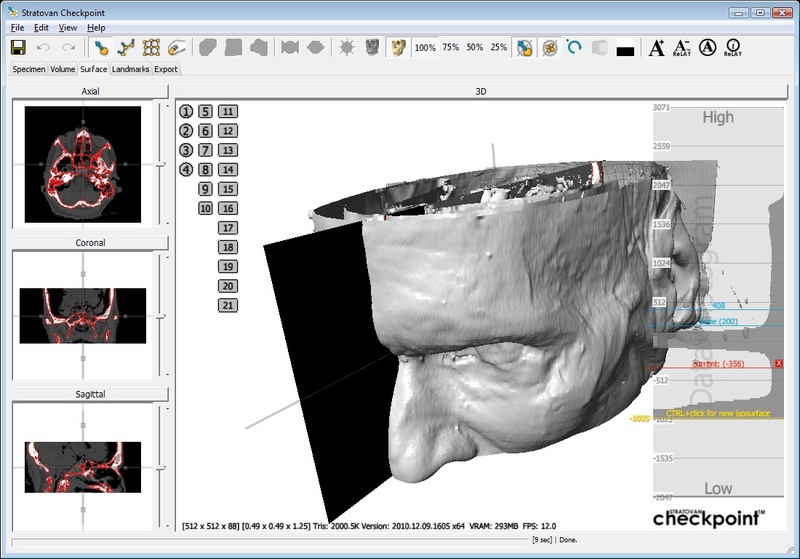 Checkpoint allows you to work with CT (and MRI) scans and provides more flexible landmark collection tools. CT, MRI, PET, and more. 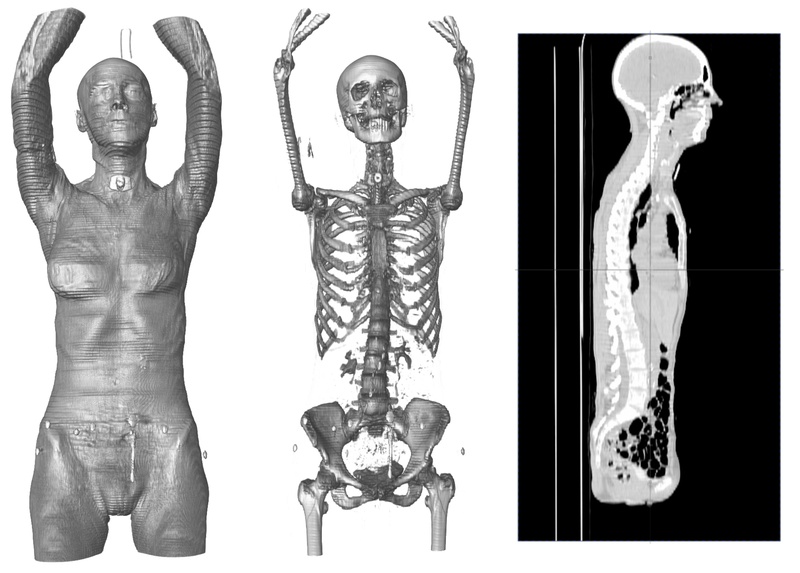 View 3D scans from a variety of modalities. Checkpoint creates a full 3D reconstruction and easily slices through the 3D reconstruction allowing you to see orthogonal and oblique slice views. 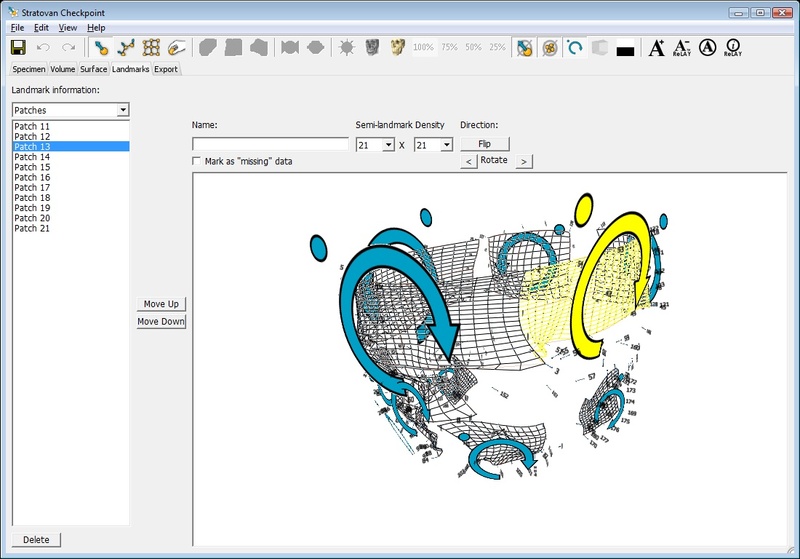 Change brightness and contrast and easily interact in 3D. Easily view, interact, and understand your patient. State of the art visualization tools allow you to inspect, manipulate, and measure every anatomic feature. Includes both 3D volume visualization and surface rendering. Shape Analysis and Longitudinal Studies Easily specify anatomic landmark points to measure complex features, such as a tumor size. Measure over time to determine and accurate growth (or shrinkage) curve. Checkpoint's easy to use landmark collection tools allows you to gather numerous 3D points faster and more accurately than other tools. Statistical Analysis Perform sophisticated 3D statistical analysis based collected points including statistical shape, morphometric, and procrustes analysis. Load DICOM, NifTI, TIFF Image Stacks and more. Export surfaces as STL, PLY, and OBJ files. It works beautifully! I could not find any other program to open CT files and landmark in 3D. It has been an absolute lifesaver. I also appreciate that new versions are always coming out, with bugs fixed and great new features. Lastly, the customer service has been outstanding. I always receive a helpful and timely response, which has even extended to a quick program update in response to a bug I was struggling with. Excellent! Thank you!!! Checkpoint has made my dissertation possible. I use Checkpoint for viewing and adding landmarks to 3D models from CT of primate skulls, 3D models from MRI of the primate brain, and also 3D laser scanned models I have taken with a surface scanner. I like its versatility but with no comprise to ease of use. I like its flexibility, great graphics, speed and ability to handle larger data files. I really like this software and have recommended it to others. The patch placement method is very good compared to other pieces of software and curve placement is also very user-friendly. Customer support has also been excellent. Specimen loading interface. 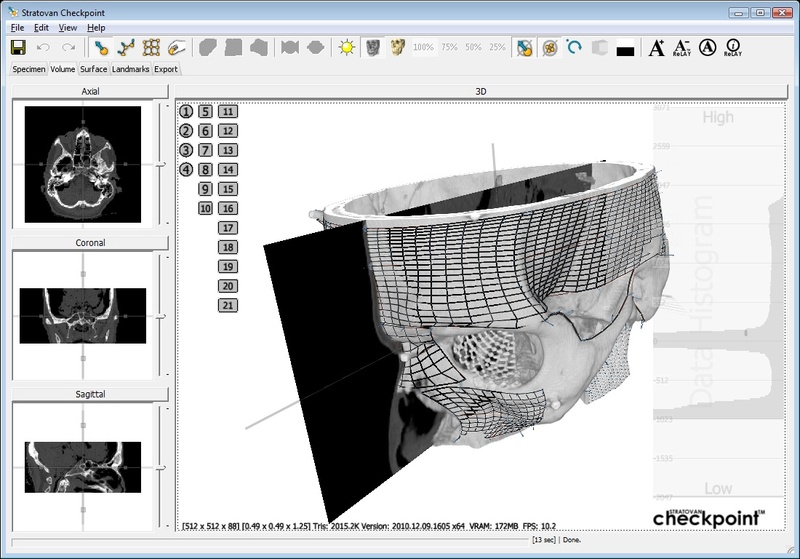 Load PLY, STL, OBJ, and WRL surface files in addition to DICOM scans (CT and MR). Browse to a folder and Checkpoint searches for data files (including subfolders). Search the specimen list easily by typing in a search. Volume rendering of a DICOM scan. You can either view the volume rendering of a DICOM scan, change contrast and brightness by left-dragging the mouse in the slice windows. The data distribution histogram is show along the right side of the 3D window. Surface rendering. 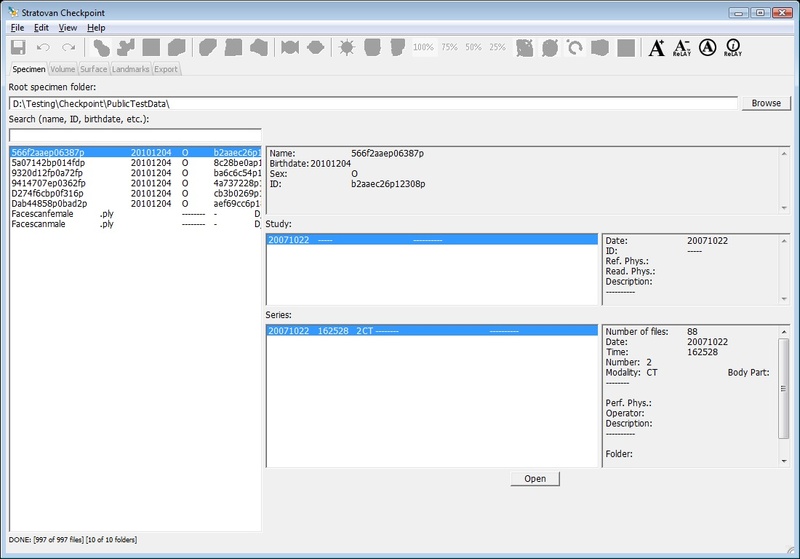 Multiple surfaces can be extracted from DICOM scans by CTRL-left-clicking on the data histogram. Landmark points can then be added to each surface. Change between them easily by selecting them. Edit landmark primitives. Change the semi-landmark point distribution density for curves and patches, view length and angle measurement, change primitive order, add names, or delete primitives. How to extract iso-surfaces from volume data. How to work with single point primitives. How to work with curve primitives. How to work with patch primitives. Ikeda, Renie, (2014). Clinical Application of a Novel Three-Dimensional Analysis to Evaluate Temporomandibular Joint Space Changes After Orthognathic Surgery, University of California, San Francisco. Kuzminsky, Susan, Gardiner, Megan, (2012). Three-dimensional laser scanning: potential uses for museum conservation and scientific research, Journal of Archeological Science, 39, 2744-2751. Bastir, Markus, Rosas, Antonio, Gunz, Philipp, Peña-Melian, Angel, Manzi, Giorgio, Harvati, Katerina, Kruszynski, Robert, Stringer, Chris, Hublin, Jean-Jacques, (2001). Evolution of the base of the brain in highly encephalized human species, Nature Communications, doi:10.1038/ncomms1593. Lysianna Ledoux, Myrium Boudadi-Maligne, (2015). The contribution of geometric morphometric analysis to prehistoric ichnology: the example of large canid tracks and their implication for the debate concerning wolf domestication, Journal of Archaeological Science, 61, 25-35. Aida Gómez-Robles, José María Bermúdez de Castro, María Martinón-Torres, Leyre Prado- Simón, Juan Luis Arsuaga, (2015). A geometric morphometric analysis of hominin lower molars: Evolutionary implications and overview of postcanine dental variation, Journal of Human Evolution, 82, 34-50. Marta San Millán, Antigoni Kaliontzopoulou, Carme Rissech, Daniel Turbón, (2015). A geometric morphometric analysis of acetabular shape of the primate hip joint in relation to locomotor behavior, Journal of Human Evolution, 83, 15-27. Ahmet Uzun, Fikri Ozdemir, (2014). Morphometric analysis of nasal shapes and angles in young adults, Brazilian Journal of Otorhinolaryngology, 80, 397-402. Makedonska, Jana, Wright, Barth W., Strait, David S., (2012). The Effect of Dietary Adaption on Cranial Morphological Integration in Capuchins (Order Primates, Genus Cebus), PLoS One, doi” 10.1371/journal.pone.0101378. Tschopp, Emanuel, Russo, João, Dzemski, Gordon, (2014). Retrodeformation as a test for the validity of phylogenetic characters: an example from diplodocid sauropod vertebrae, Palaeontologia Electronica, 16, 1-23. Antonio Rosas, Laura Pérez-Criado, Markus Bastir, Almudena Estalrrich, Rosa Huguet, Antonio Garcia-Tabernero, Juan Francisco Pastor, Marco de la Rasilla, (2015). A geometric morphometrics comparative analysis of Neandertal humeri (epiphysis-fused) from the El Sidrón cave site (Asturias, Spain), Journal of Human Evolution, 82, 51-66. A. Mitrovski-Bogdanović, Ž. Tomanović, M. Mitrović, A. Petrović, A. Ivanović, V. Žikić, P. Starý, C. Vorburger, (2014). The Praon dorsale-yomenae s. str. complex (Hymenoptera, Braconidae, Aphidiinae): Species discrimination using geometric morphometrics and molecular markers with description of a new species, Zoologischer Anzieger – A Journal of Comparative Zoology, 253, 270-282. Joseph Owen, Keith Dobney, Allowen Evin, Thomas Cucchi, Greger Larson, Una Strand Vidarsdottir, (2014). 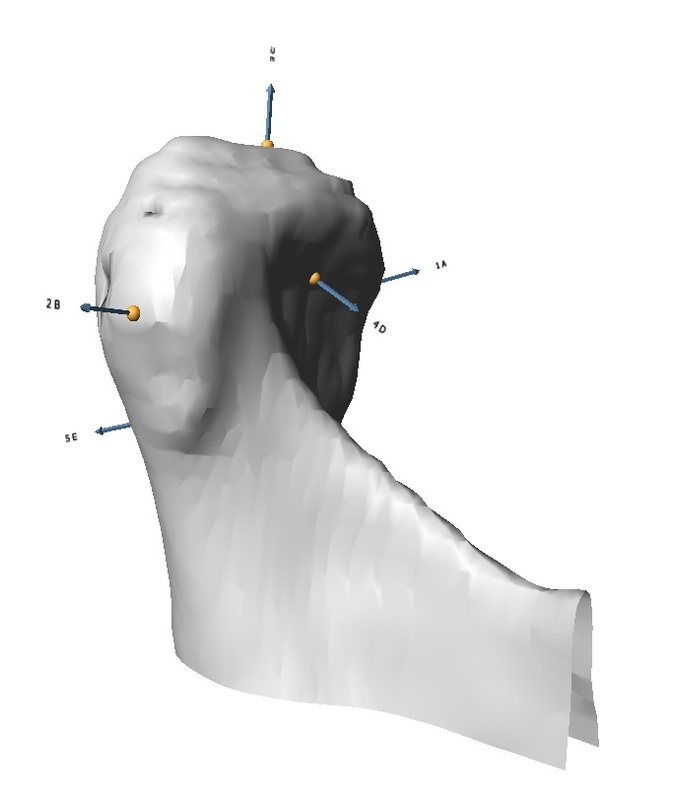 The zooarchaeological application of quantifying cranial shape differences in wild boar and domestic pigs (Sus scrofa) using 3D geometric morphometrics, Journal of Archaeological Science, 43, 159-167. Julia Arias-Martorell, David M. Alba, Josep M. Potau, Gaëlle Bello-Hellegouarch, Alejandro Pérez-Pérez, (2015). Morphological affinities of the proximal humerus ofEpipliopithecus vindobonensis and Pliopithecus antiquus: Suspensory inferences based on a 3D geometric morphometrics approach, Journal of Human Evolution, 80, 83-95. Kyra E. Stull, Michael W. Kenyhercz, Ericka N. L’Abbé ,(2014). Ancestry estimation in South Africa using craniometrics and geometric morphometrics, Forensic Science International, 245, 206.e1-206.e7. Stephen J. Lycett, Noreen von Cramon-Taubadel, (2013). Understanding the comparative catarrhine context of human pelvic form: A 3D geometric morphometric analysis, Journal of Human Evolution, 64, 300-310. W.C.H. Parr, S. Wroe, U. Chamoli, H.S. Richards, M.R. McCurry, P.D. Clausen, C. McHenry, (2012). Toward integration of geometric morphometrics and computational biomechanics: New methods for 3D virtual reconstruction and quantitative analysis of Finite Element Models, Journal of Theoretical Biology, 21, 1-14. David K. Thulman, (2012). Discriminating Paleoindian point types from Florida using landmark geometric morphometrics, Journal of Archeological Science, 39, 1599-1607. Šárka Bejdová, Václav, Krajíček, Miroslav Peterka, Pavel Trefný, Jana Velemínská, (2012). Variability in palatal shape and size in patients with bilateral complete cleft lip and palate assessed using dense surface model construction and 3D geometric morphometrics, Journal of Cranio-Maxillofacial Surgery, 40, 201-208. Isabelle De Groote, (2001). Femoral curvature in Neanderthals and modern humans: A 3D geometric morphometric analysis, Journal of Human Evolution, 60, 540-548. Claire E. Terhune, William H. Kimbel, Charles A. Lockwood, (2007). 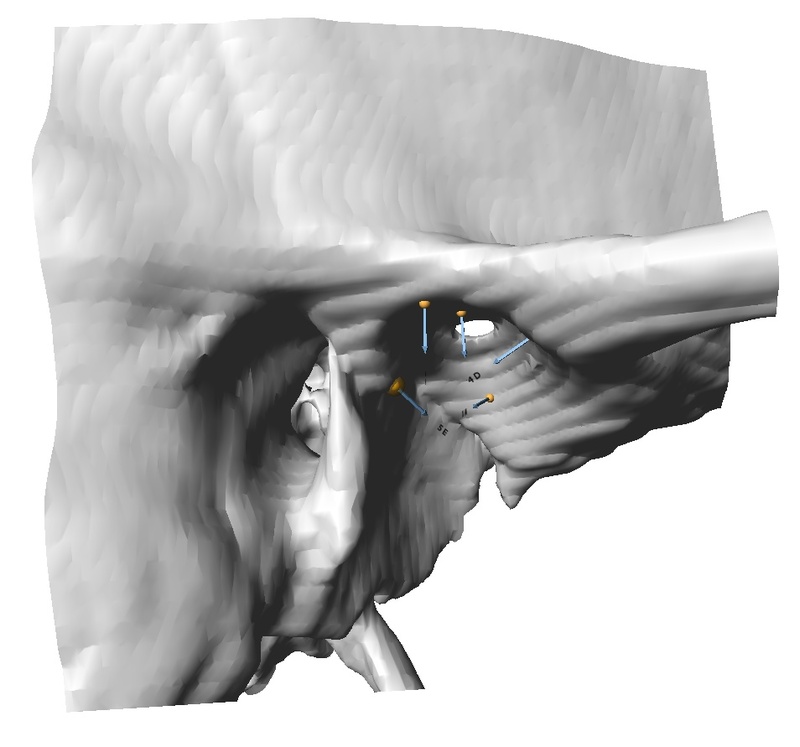 Variation and diversity in Homo erectus: a 3D geometric morphometric analysis of the temporal bone, Journal of Human Evolution, 53, 41-60. Please change the publication date and version entries to match the version of software you are using. From within the software, click Help | About to find the version information. Our software versions are based on the date of production so only the YYYY.MM.DD fields are needed. * Data size is based on the size of your data files. † Or better than indicated. ‡ OpenGL 3.0 or later. 64-bit CPU and Operating System required for data sizes over 100MB. 1GB of hard disk space for installation. 1920 x 1080 pixel display or better.